You will be able to trim your grass and have your lawn be the talk of the neighborhood with the Greenworks 21&quot; 13 Amp Corded Lawn Mower 25112. It features 3-in-1 mowing capabilities, including mulching, rear collection and side discharge. 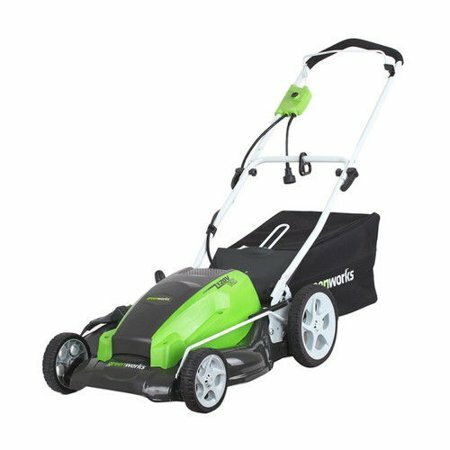 Greenworks 21&quot; electric lawn mower has a 21&quot; wide cutting path offers a balance of maneuverability and cutting capacity for mid-sized areas. The powerful 13 amp motor provides tough cutting and mulching power for long grass or weeds. Greenworks corded lawn mower has a rugged, stamped-steel cutting deck that provides added durability. It has an adjustable cutting height. The cam lock handle makes for easy folding and storage of unit. The tough tool is ideal for mid-sized yards and lawns. It has 7&quot; front wheels and 10&quot; rear wheels. The convenient cord lock prevents the cord from disconnecting during use. You will be able to trim your grass and have your lawn be the talk of the neighborhood with the Greenworks 21" 13 Amp Corded Lawn Mower 25112. It features 3-in-1 mowing capabilities, including mulching, rear collection and side discharge. Greenworks 21" electric lawn mower has a 21" wide cutting path offers a balance of maneuverability and cutting capacity for mid-sized areas. The powerful 13 amp motor provides tough cutting and mulching power for long grass or weeds. Greenworks corded lawn mower has a rugged, stamped-steel cutting deck that provides added durability. It has an adjustable cutting height. The cam lock handle makes for easy folding and storage of unit. The tough tool is ideal for mid-sized yards and lawns. It has 7" front wheels and 10" rear wheels. The convenient cord lock prevents the cord from disconnecting during use. I really like this it cuts really good the only thing is I fight with the cord but that's a lot better than have to remember is there gas pulling on the cord running out of gas? This I just plug it in and start cutting! Very light weight - compared to gas mowers. Easy to set up. Not self propelled, but light enough that it doesn't have to be. I have a pretty big yard and the only learning curve was keeping in mind that you have to start from the source of power and move outward. Very quiet, easy to use. I had a B&D electric mower over 20 years ago and that didn't last very long. Hopefully this will be my very last mower. Easy to set up and get going! The only thing I would warn you about is the plug guard on the lawn mower is pretty snug, so make sure your extension cord has one of the flatter bases.